Can a Fatwa Against Terrorism Stop Extremists? This may be the fatwa the world has been waiting for. It was delivered, not in a mosque or a madrasah, nor in some dark corner of cyberspace, but in a wood-paneled hall opposite St. James' Park in London last week. Though issued just across the street from Britain's Foreign Office, its author, Shaikh Muhammad Tahir-ul-Qadri, stressed that neither he nor Minhaj ul-Quran, his Pakistan-based organization, was supported in any way by any government. His voice and finger often rising sternly, the sheik delivered a far-reaching diatribe against terrorists and what he described as their wrongheaded concept of jihad. His fatwa: Terrorism is at all times, in all conditions, against Islam. The murders terrorists commit will send them, not to paradise, as often claimed, but to hell. "[Terrorists] are the heroes of hellfire," he thundered. Their actions are not just unlawful but render terrorists kufr, or disbelievers, casting them outside the Islamic faith. Thousands of clerics have spoken out against terror since 9/11, but Qadri, a highly respected, Pakistan-born scholar with hundreds of books to his name and millions of followers everywhere from Syria to Fiji, has issued a fatwa that just might have traction. Quilliam, the U.K.-based antiextremist think tank, declared it a "highly significant step towards eradicating Islamist terrorism." The following day, as TIME was wrapping up an interview with Qadri, President Hamid Karzai's office was on the phone from Kabul, asking for the rights to translate the fatwa into Dari and Pushtu. At 600 pages, Qadri's fatwa may well be the most detailed antiterror fatwa ever written, but it's far from the first. Since 9/11, clerics from Iran's Supreme Leader Ayatollah Ali Khamenei to al-Jazeera's televangelist Sheik Yusuf al-Qaradawi have condemned terrorism. In 2008, 6,000 Indian Muslim clerics endorsed an antiterror fatwa. 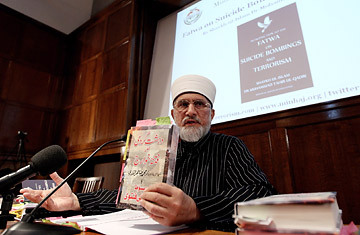 Qadri himself was among the 170 Islamic scholars from various sects who signed an antiterrorist fatwa in Amman in 2005. But none of these fatwas has stopped terror. The Amman fatwa was delivered a day before four British suicide bombers killed 52 people on London transport. Too often, fatwas lose their force because they're delivered by establishment scholars, who are seen as protecting the regimes they serve. Fear blunts fatwas, too: last year, Sarfraz Hussain Naeemi, a prominent Pakistani cleric and an outspoken critic of Taliban violence, was killed by a suicide bomber soon after he'd issued an antiterror statement on Pakistani TV. Fearful of retributions, clerics frequently pad their antiterror fatwas with exceptions, says Qadri, or  more sinisterly  with ambiguous language. "Many clerics were condemning, but they are scared, so they condemn in a very soft way, with ifs, and buts," he says. "To save themselves from the terrorists, they speak in a conditional and doublespeak way." After 9/11, al-Jazeera's Qaradawi made a distinction between al-Qaeda bombers  whom he condemned  and the jihad of the Palestinians, which he deemed legitimate. The Grand Sheik of Al-Azhar, Muhammad Sayyid Tantawi, has seemed to flip-flop on whether Palestinian suicide bombing is terrorism, or legitimate martyrdom. Qadri's fatwa, by contrast, makes no exceptions. "This is an absolute, unconditional, unqualified condemnation of terrorism, without any kind of exception or excuse," he declaimed at its launch. "No context, no discussion of foreign policy of a certain country, no occupation ... can create a pretext for the people to take up arms." The solution, says Qadri, is not violence, but democratic dissent, achieved through political channels, petitions, lawful activism and peaceful protest. The fatwa's blanket nature worries some. "It has intelligent, noble ideas that I accept and subscribe to totally," says Fuad Nahdi, a British Muslim community-affairs analyst. "But it doesn't acknowledge the issues on the ground, where people are frustrated by Western alliances to corrupt governments. Talk to a villager in Pakistan or Afghanistan, and tell them to petition their government or resort to peaceful protest, and they'll tell you that the only sign of government they've seen is the drones dropping bombs on them."